“Public understanding of science is a passion of mine,” writes David Eagleman, a neuroscientist and author who runs Eagleman Laboratory for Perception and Action in Houston. This passion is echoed in one of his latest scientific publications, somewhat ambitiously dubbed as a manifesto. Appearing in the commentary section of The Journal of Neuroscience, Eagleman’s “Why public dissemination of science matters: A manifesto” is a succinct explainer, peppered with appropriate examples of science communication gone both good and bad. 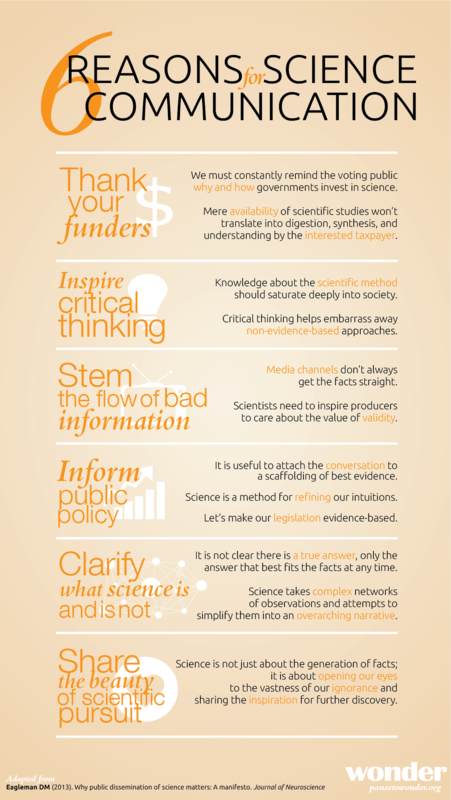 Aimed at other researchers, it offers six compelling reasons to help remember it’s not just important to do science; you also have to tell other people about it. I agree with Eagleman’s message wholeheartedly, and think that his article also has something to offer to fellow science communicators when arguing for everything from critical thinking in schools to why science is amazing in its own right. To help disseminate the message, I’ve distilled Eagleman’s arguments into an even more succinct visual message. If you like it, pass it around! Follow this link to view/download a larger version of the poster [PNG]. And if you want to acquaint yourself with the full article, the author has made it available on his page. Head over to this link [PDF].